Earlier this week I spent 4 days and 3 nights on and around Lake Vänern, in central Sweden, with my Nordic Environmental Studies class. This trip was best described on the first night when I was reading about Helsinki in my Fodor’s Scandinavia book, and left to go to the toilette, and when I came back, my professor and his friend (both in their late 60’s) looked at me, then at the book, and said that there is nothing in that book worth seeing. They may not entirely be correct from my point of view, but they have a good point, and the trip they took us on is hard to find on a map, let alone in a guide book that focuses mostly on urban areas. This trip was a journey to see a Sweden that is rarely traveled by anyone from outside of Sweden (or outside of Värmland for that matter) and many of the places we went aren’t even on this massive map I have of Scandinavia. Needless to say, it was a pretty amazing trip. Håverud is a tiny town just to the west of Lake Vänern, and is one of the places not on a map unless you are in the general area. The thing that makes it famous, however, is the boat-bridge. The bridge was built into a lock-system (like the locks used in the Panama Canal), and because the rock on one side was too soft to build a lock, they constructed a bridge to the other side. We took the canal up to the next lake, where we saw some old petroglyphs as well as some pretty amazing views on the water. After the boat ride back we had a communal dinner at the hostel, followed by some card games, which I lost, and therefore had to cook eggs for everyone in the morning. We left Håverud early the next morning to go further south, but stopped at the major lock system that connects Lake Vänern with the North Sea. 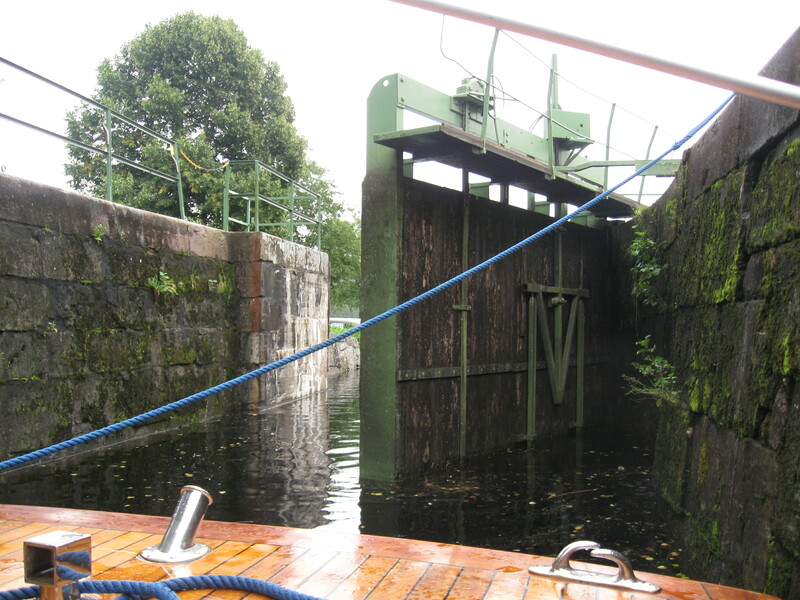 It was here they built one of the oldest lock system in the early 1800’s. The doors are gone, but it is a pretty cool place nonetheless. Right next to the old locks are some newer locks. These were built in the early 1900’s and are still used today. We then continued south to the island of Kållandsö, where we were treated to a lunch with the best smoked salmon I’ve ever had. We then boarded our Professor’s friend’s boat to go to the island of Lurö for the night. On the boat, I decided to sit at the front, and ended up getting soaked because of the choppy water. Carolijin, Shelly, and Wes before the girls and I got completely soaked. Getting really wet, and loving it. Me after the ride, completely soaked. Lurö is a small island right in the middle of Lake Vänern that used to have a small community that lived there. Now only one man and his wife live there full time, and they run a small retreat for school groups. We went on a hike to the end of the island, and then took a boat back to the living areas for some dinner where we learned the “proper” way to eat crayfish as well as a night spent on the boat. Oaks on the hike. This is what most of Sweden looked like before the timber industry arrived, now the forests are relatively young. When we got back we found out that we would be sleeping on a boat, and unlike the Red Boat we stayed on in Stockholm, this was a super rad sailboat. The next morning Hans, our professor’s friend, had a migraine and we were unable to leave the island until the afternoon, so I went on a hike the the northern end of the island, which had even more great views. On the boat ride back as well as that evening I was able to talk to Hans for a while. He is an avid rock ‘n’ roll fan, in particular for Elvis, which is why he has some huge sideburns. He has seen The Beatles in Karlstad as well as Jimi Hendrix, Led Zeppelin, and others in Göteburg. On the way back to the bus, we stopped to visit a Swedish Castle. The castle was a summer home for a Count in the 1400’s, but wasn’t used for anything since then, and just recently the government gave a grant to restore it. The insides were practically empty, but it is always cool to see a castle. After the castle we went to Tröllhattan for another night in a hostel, and the next day on the way to Lidköping we stopped to see a remake of a viking ship, which was seen in the movie Arn. My favorite thing about this ship is that even though it was a remake, a lot of attention went into the details. After the viking ship we went to Lidköping to visit the Vänermuseet, which had a Harley-Davidson exhibit upstairs and the Lake’s history downstairs. After the museum we made one more stop on the way home at a sandstone mine, which Hans and Pontus (my professor) kept claiming was Colorado, and therefore everyone in the class kept asking me if I was excited to go home because Colorado was only 20 kilometers away. The place wasn’t exactly Escalante, but it was still pretty cool. After the mine we went back to Karlstad where I sit now happy to have shared with you my Lake Vänern experience. My planned trip to Helsinki is looking like it might not happen next weekend, which is OK because it means I’ll have more money for my Euro-Rail adventure in two weeks. So my next post will either be Helsinki in two weeks or a Euro-Rail adventure post sometime in October. I hope everything is going well where ever you might be, and as you might expect, everything is great here. It looks like it is getting cold there! Or is it just humidity? Wow! I stumbled upon your blog by mere coincidence today because I was looking for imformation about life in Karlstad. I’m going to be studying at Karlstad University in the Spring and reading about your adventures has made me even more exited about it!